Mitchell, right, with UF Health Cancer Center Director Jonathan Licht, M.D. 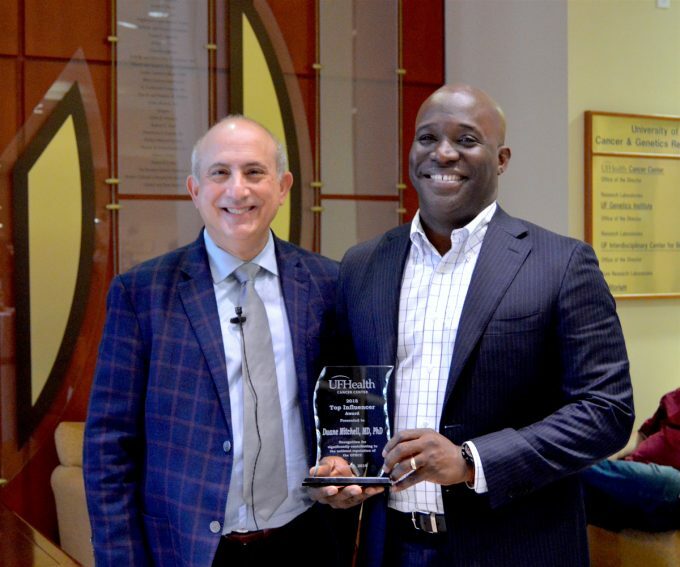 At the UF Health Cancer Center‘s Cheers to the New Year event on Wednesday, Jan. 9, Duane Mitchell, M.D., Ph.D., was named the Center’s Top Influencer of 2018. The award was in recognition of Mitchell, co-director of the Preston A. Wells, Jr. Center for Brain Tumor Therapy at the University of Florida, significantly contributing to the national reputation of the cancer center. Mitchell also serves as co-leader of the Cancer Therapeutics and Host Response research program at the UF Health Cancer Center.